Find us on Facebook, Twitter and Pinterest! The Alburtis Lockridge Historical Society was formed in 1976 by a small group of individuals to preserve the local history. Our Mission: Preserve the history of towns of Alburtis & Lock Ridge, along with the outlying areas. Description: The Borough of Alburtis was incorporated in 1913 by the joining of two villages, Alburtis & Lock Ridge. The Alburtis-Lock Ridge Historical Society began in 1976, the year of our country's bicentennial. We are a group to preserve the history of the villages of Alburtis and Lock Ridge. The Society calls home the former Lock Ridge Memorial Presbyterian Church. Museum possessions include the church's cornerstone contents, keepsakes from businesses and former businesses and many old photographs, including nearly 100 from 1906. Tours are available during Open Houses or by appointment only. We are a small group of only about 12 individuals. We are always looking to increase our membership to expand our membership rolls & revitalize our organization. 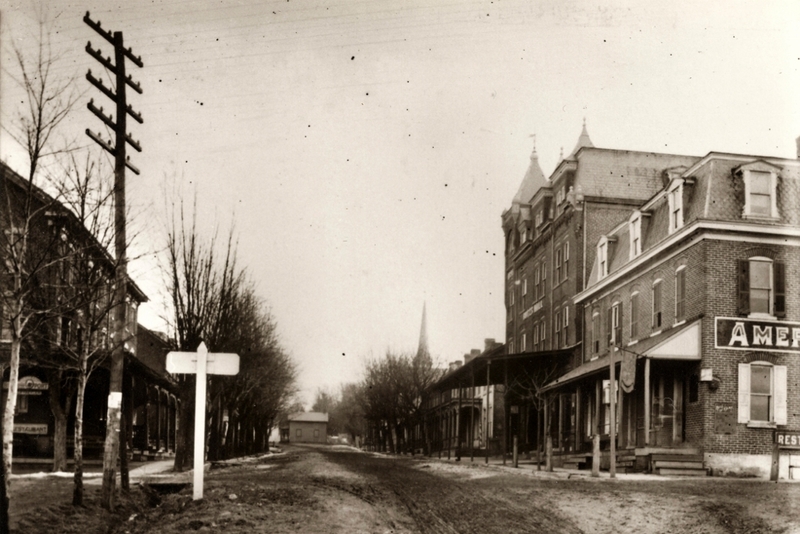 Lehigh County showed major signs of development by 1850, with communities already established throughout the region. The area which is now Alburtis, was still mostly scrub oak, along with a few scattered farms. The first known dwelling in the vicinity was a log house built by Joseph Rothenberger. Following that, a stone dwelling was erected by John Blank in 1847 and became the first hotel in the area that would eventually become Alburtis. Construction of the East Pennsylvania Branch of the Philadelphia and Reading Railway was completed in 1858 and began operation in 1859. Whereas a railroad station was established here, the location needed a name. Although no documentation exists, legend has it that Edward K. Alburtis, civil engineer, responsible for construction of the railroad, spent much time in our area, possibly staying at John Blank’s hotel. He was very fond of the area and in 1859, when the Railroad Board of Directors made their tour, they named this location in his honor. Mostly persons of German origin settled the area and ironically, our town derived its name from an Italian. About a mile to the south was the hamlet of Hensingersville, having derived its name from Peter Hensinger, who built this area’s original hotel in 1846. Additional buildings and several businesses appeared and a post office was established. 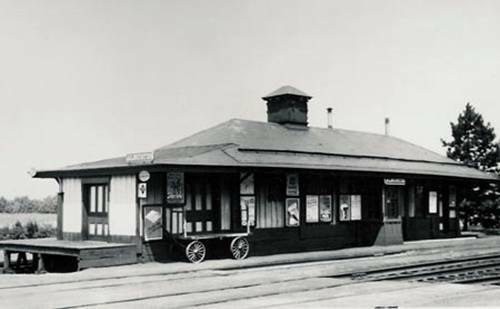 The opening of the railroad halted their growth, while building activity flourished in the Alburtis area. On February 27, 1868 the post office was transferred from Hensingersville to Alburtis. The Catasauqua and Fogelsville Railroad, a joint venture of the Crane Iron Co., Catasauqua and the Thomas Iron Co., Hokendauqua, was built to improve transport of iron ore from various mines in the surrounding area. The line was extended to Alburtis in 1864, forming a junction with the East Pennsylvania Railroad. In 1865, the line was again extended, crossing the East Penn and terminating at the mines in Rittenhouse Gap, Berks County. 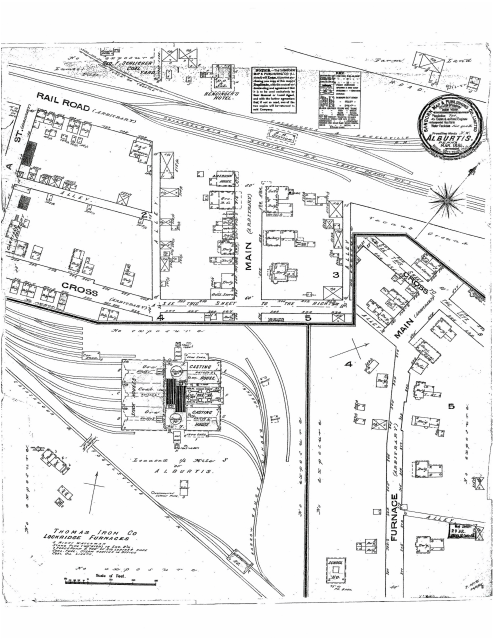 Due to railroad access and iron mine locations, the Thomas Iron Co. purchased a tract of land, consisting of 88 acres and 101 perches located southeast of the intersection of the Catasauqua and Fogelsville and East Penn Railroads. The land was resold to the Lockridge Iron Co. on March 4, 1867. 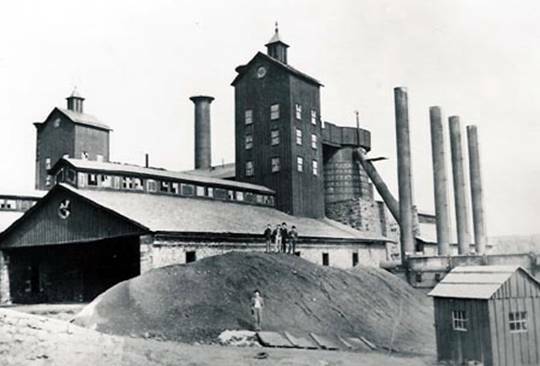 Construction of the Lockridge Furnace began in 1867, with the first furnace put into blast on March 18, 1868. The second furnace was blown in on July 9, 1869. Following start-up, the Lockridge Iron Co. was purchased by the Thomas Iron Co. Real estate holdings increased to 170 acres and 93 perches. By the time furnace operations commenced, construction of a substantial superintendent’s residence, two homes for foremen and housing for thirty four families of furnace employees was completed. For single employees, a boarding house was also maintained at the furnace site. Land was set aside for a church and cemetery. This entire area, abutting Alburtis, became known as Lock Ridge. Small mines opened throughout the area and unsightly open pits cluttered the landscape. These mines were moneymakers for the property owners and aesthetics took a back seat to wealth. On February 5, 1877 a section of mine, believed to be the Hensinger mine, collapsed, killing two workers. Information is sketchy, but William Hunsberger, age 25, with a pregnant wife and other children was one of the casualties. Reese Lewis, age 27, with three young children was the other fatality. Both are buried, side by side, in Lehigh Church cemetery. Both villages flourished and even though each had its own identity, the combined area was known as Alburtis. Obviously one industry is not enough to support a community and efforts were made to attract other employers. Several shirt factories located here, creating many new jobs. In 1897, ground was broken for a silk mill, which was equipped with twenty five broad silk looms and employed thirty persons. In 1902 the frame structure was completely destroyed by fire and it was replaced by a brick structure in 1904. A shoe factory opened around the turn of the century, but lasted for only a short period. In 1870 a new school building was constructed, but increased population necessitated a larger structure, which was built in 1874. The latter was maintained as a school until the mid 1950s, when it was replaced by a more modern facility. After being vacant for several years, the facility was sold to the Borough of Alburtis by the East Penn School District on May 7, 1963 for $324.42, plus $64.55 for legal services. 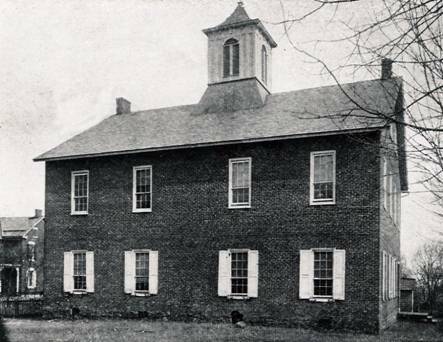 After repairs and renovations, the building was utilized as Alburtis Borough Hall for more than thirty-five years. When it was determined that major costs would have to be incurred to maintain the structure, council decided the building should be replaced. At 7:30 AM on September 8, 1998, demolition of the existing structure began. Construction of the new Borough Hall began shortly thereafter and in May, 1999 the facility opened. The majority of freeholders residing in the town of Alburtis made an application for a charter of incorporation. The Court of Quarter Sessions, on May 9, 1913 decreed “that the said town of Alburtis, be incorporated into a borough, in conformity with the prayer of the petitioners; that the corporate style and title thereof shall be The Borough of Alburtis, according to the boundaries set forth in the petition.” It was further decreed that the said borough shall be a separate election and school district and that the American Hotel, Tilden E. Kuhns, proprietor, be designated and constituted the polling place of the said borough. It was further provided that the first election, for the election of officers provided by law, should be held on Tuesday, the 10th day of June, 1913. At the first meeting held June 13, 1913 at Knedler’s Hall, the Burgess and Council took their oaths of office. By motion: to use high school room as meeting place on second Monday of month at 7:30 PM. On January 28, 1915, a committee was established to provide police protection for the borough. A part time policeman hired, starting April 1, 1915 and to continue for one year. Compensation established at $75.00 per annum. Council determined that police shall be provided with all necessities pertaining to his office. A review of bills for payment indicates that $15.90 was spent for equipment. The policeman was reappointed for another year on April 1, 1916. For conduct unbecoming an officer, he was relieved of duties on September 5, 1916. At a special meeting held June 4, 1917 to determine if council will purchase a Motor Chemical Apparatus for the Fire Co., council was in agreement, providing Fire Co. assumes some financial responsibility and also provides suitable storage space. At the September 12, 1917 meeting, it was reported that the Fire Co. found it impossible to accept proposition by council. Representatives of Ideal Motor Car Co. present at February 4, 1918 meeting. They reported that a Vin Fire Apparatus is available at a cost of $1645.00, while a model used for demonstration purposes, can be purchased for $1250.00. Council authorized preparation of ordinance to purchase truck for $1250.00 on May 6, 1918. Ideal Motor Car Co. instructed to have the words “Alburtis No. 1” painted in as large letters as possible on both sides of the body. Following World War I, the price of iron fell. Problems increased when foreign iron was imported at prices much lower than that of locally produced products. Local furnaces were shut down and by the end of 1921, Lockridge Furnace was no longer in operation. The furnace property was sold and in the course of the next few years, the structures were demolished for scrap purposes. On November 7, 1924, dynamite blasts forever ended the iron industry in Alburtis. The property lay idle until 1970 when Lehigh County purchased the property. The area was transformed into Lockridge Park and Museum, which officially opened in August, 1976. The park includes the partially restored iron works complex and surrounding land. An extensive path system is suited for walking or biking. The Furnace Museum is unique and is dedicated to the anthracite iron industry. The park is open daily, from dawn to dusk with ample parking areas. The depression also took its toll. Shirt factories were forced to close and left countless residents without jobs. Industries never made the rebound and today Alburtis has become a total residential community, with a population of approximately 2,300 persons. Rev. Laros’ dreams of industrial development were short lived, but his vision of being one of the most preferable residential centers became a reality. Chronologically, we are the “baby borough” in Lehigh County and what we lack in years, is overshadowed by the history surrounding its growth. Last year, with the aid of grants, the Alburtis-Lockridge Historical Society was able to document much of the history in the form of a professionally produced video. The sixty-two minute video, containing many archival photos, centers around personal interviews of sixty-seven past and present residents, who shared memories of their lives in Alburtis. Lock Ridge Furnace/Thomas Iron Co.
A. K. Snyder Butcher, circa 1906.